Visiting the stately homes of England is an absolute must on any UK road trip. One thing is for sure: You are spoiled for choice when considering the Stately Homes of England. There are hundreds open for public viewing at one time or another. Because “hundreds” is not on your range of options. Here’s a list of my ten favourite Stately Homes of England. Again I emphasise that this list is a personal selection. You might want to take a look at others because of a particular interest you have. If you only have time for one stately house, a visit here is probably your best bet. You can throw it in with a day trip to Oxford. Blenheim Palace is a monumental country house in Blenheim, Oxfordshire, England. It is the principal residence of the Dukes of Marlborough, and the only non-royal, non-episcopal country house in England to hold the title of palace. The palace, one of England’s largest houses, was built between 1705 and 1722 and designated a UNESCO World Heritage Site in 1987. The palace is named in memory of the 1704 Battle of Blenheim. It was intended to be a reward to John Churchill, 1st Duke of Marlborough for his military triumphs against the French and Bavarians in the War of the Spanish Succession, culminating in the Battle of Blenheim. Soon after construction began, it became the subject of political infighting; this led to Marlborough’s exile, the fall from power of his duchess, and lasting damage to the reputation of the architect Sir John Vanbrugh. Following the palace’s completion, it became the home of the Churchill, later Spencer-Churchill, family for the next 300 years, and various members of the family have wrought changes to the interiors, park and gardens. At the end of the 19th century, the palace was saved from ruin by funds gained from the 9th Duke of Marlborough‘s marriage to American railroad heiress Consuelo Vanderbilt. You can visit Blenheim Palace as part of a Great British Road Trips tour from Oxford to Stratford-on-Avon. I first visited Hatfield House, on the northern edge of London, years ago when they ran Elizabethan Banquets in the Great Hall. Hatfield House, built in 1611 adjacent to Hatfield Palace. It is a fine example of Jacobean architecture. It’s real claim to your attention is its history. Henry VIII used the palace as the family home for his children, Mary, Elizabeth and Edward. Later, Mary, as queen, kept Elizabeth there in the next best thing to house arrest. Because Elizabeth was next in line to the throne, she was entitled to received important state papers and each day a dispatch rider would make the 21-mile journey from London. On arrival, he would bow and say “I bring your news from London, ma’am”. One day, while Elizabeth was sitting beneath an oak tree in the garden – it’s still there! – the rider came in like the hounds of hell were at his heels. He leapt from his horse, went down on one knee and said: “Your Majesty, I bring you news from London”. Elizabeth did not need to open the pouch to know that Mary had died and she was now Queen Elizabeth I. She held her first council of state in the Great Hall of the palace. Thus it was a special experience to dine in the very room where that momentous meeting took place. The public banquets are, sadly, no longer held there. James I, Elizabeth’s successor, was not a fan of the palace so he swapped it for the family home of his (and Elizabeth’s) First Minister, Robert Cecil, 1st Earl of Salisbury. He tore down much of the original palace and built the present structure which has been the home of the Cecil family ever since. It’s probably fair to say that Highclere would not, under normal circumstances, have made it into a list of Top Ten British stately homes. In reality just a minor Great House, except for one thing: the tv series Downton Abbey which used the exterior, the great hall, dining room, library, music room, drawing room, saloon and several of the bedrooms for filming. 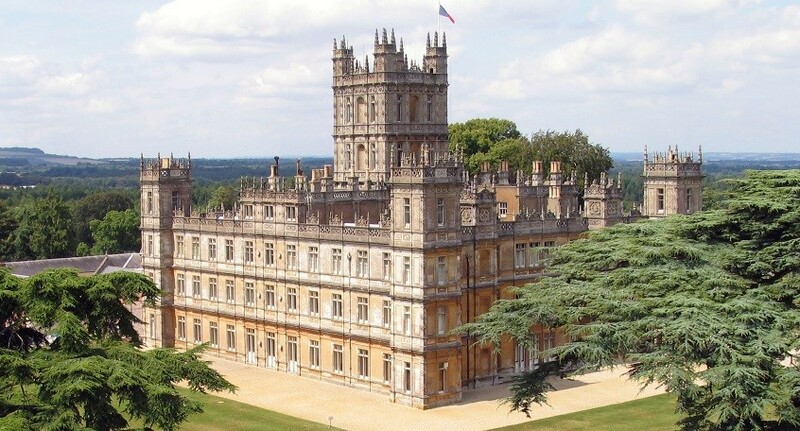 Shooting is underway for the Downton Abbey film, again using Highclere as a location. It was also the setting for the tv comedy series, Jeeves and Wooster, starring Stephen Fry and Hugh Laurie. The gardens, designed by the great Capability Brown are a particular feature, as is the Antiquities Room. Much of the booty he brought home was sold off to the Metropolitan Museum of New York to pay death duties, but much remains and is well worth a visit. Highclere Park, Highclere, Newbury, Hampshire. You can visit Highclere Castle as part of a Great British Road Trips tour from Brighton to Winchester. When you have owned a home for 450 years and throughout that time had the dosh to afford to buy artworks you kinda build up a remarkable collection of fine art. Thus it is with the Cavendish family, the Dukes of Devonshire, who have amassed an art collection that spans 4,000 years, from ancient Roman and Egyptian sculpture, and masterpieces by Rembrandt, Reynolds and Veronese, to work by Stately Homes of England #outstanding modern artists, including Lucian Freud, Edmund de Waal and David Nash. It’s one of the few country houses where the interiors trump the Capability Brown gardens, set in a mere 1000 acres of Derbyshire countryside, themselves a remnant of thousands of acres sold off in previous years to pay death duties. There are over 30 rooms to explore, from the magnificent Painted Hall, regal State Rooms, restored Sketch Galleries and Sculpture Gallery. 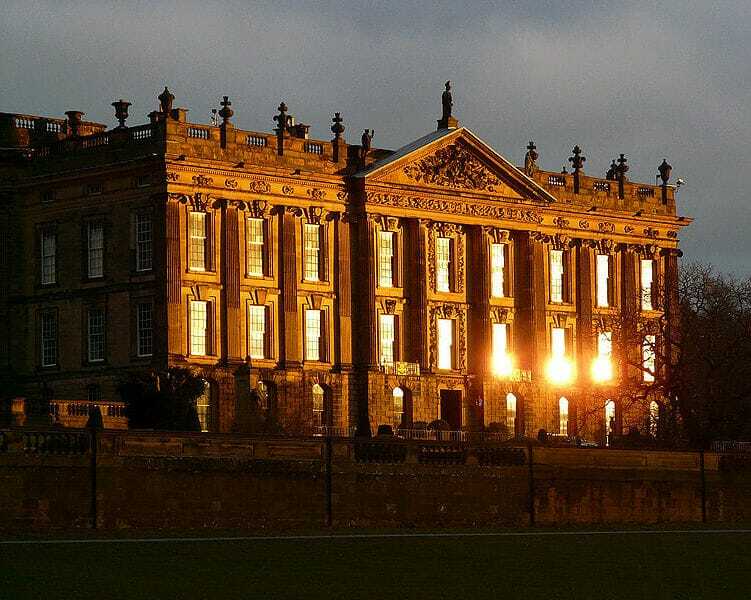 Like many of the other properties on this list it has had its moment of cinematic fame as the background for the production of the 2005 film Pride and Prejudice, it was set in The Crown as an interior of Buckingham Palace, and featured in a couple of episodes of Peaky Blinders. A classic upper-class estate . . . 8,000+ acres including several villages and farms as well as sculpture gardens, lakes, temples, and monuments. “Been in the family for over 300 years, don’t y’ know”. The family, in this case, is the Howards. It was built as the family home of the Duke of Norfolk and took 100 years to complete. And we think some construction projects are slow these days. Mark you, this is a magnificent edifice, and the sheer artistry and craftsmanship are probably what took the time. Fairly much sums up why it is worth a visit. The estate, with over 200 listed buildings and monuments, is situated within the Howardian Hills. It is a designated Area of Outstanding Natural Beauty 15 miles north-east of York. It is approximately 8,800 acres (3,561 ha), made up of 6,100 acres of farmland, 2,100 acres of woodland and 600 acres of parkland. If you are a fan of Evelyn Waugh’s Brideshead Revisited, you’ll recognise the exterior from both the tv series and the 2008 film. You can visit Castle Howard as part of a Great British Road Trips tour from York to Durham. 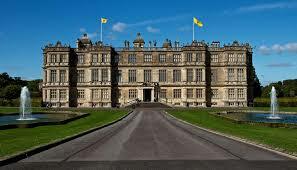 “Longleat is an the seat of the Marquesses of Bath. It is a leading and early example of the Elizabethan prodigy house. It is adjacent to the village of Horningsham and near the towns of Warminster and Westbury in Wiltshire and Frome in Somerset. It is noted for its Elizabethan country house, maze, landscaped parkland and safari park. The house is set in 1,000 acres (400 ha) of parkland landscaped by Capability Brown, with 4,000 acres (1,600 ha) of let farmland and 4,000 acres (1,600 ha) of woodland, which includes a Center Parcs holiday village. It was the first stately home to open to the public, and the Longleat estate includes the first safari park outside Africa. The house was built by Sir John Thynne and was designed mainly by Robert Smythson, after Longleat Priory was destroyed by fire in 1567. It took 12 years to complete and is widely regarded as one of the finest examples of Elizabethan architecture in Britain. Longleat is occupied by Alexander Thynn, 7th Marquess of Bath, a direct descendant of the builder; however, the peer passed the management of the business to his son Viscount Weymouth early in 2010″. Sir John bought the place for £53. Not a bad investment. The house is widely regarded as one of the best examples of Elizabethan architecture in Britain and one of the most beautiful stately homes open to the public. This former 16th Century Augustinian priory contains many treasures and heirlooms acquired by generations of the Thynne family, some of whom were great collectors of their day. The collection comprises early books and manuscripts, paintings including works by Titian and Reynolds, Flemish tapestries, and fine French furniture all housed within 19th-century opulent interiors created by John Dibblee Crace. Outside there’s the Safari Park with all manner of wild animals. You can get up close and personal with some of them . . . but maybe not with the lions, tigers, gorillas, cheetahs, wolves or rhinoceroses. You can visit Longleat House as part of a Great British Road Trips tour from Bath to Salisbury. It is “Described as ‘England’s greatest Elizabethan house’. Burghley was built and designed by William Cecil, Lord High Treasurer to Queen Elizabeth I, between 1555 and 1587. Its grounds include 2,000 acres of Capability Brown (him again!) gardens and a deer park. The house was the setting for Castel Gandolfo in the film The Da Vinci Code. It is also the location for the famous Burghley Horse Trials, one of the major equestrian events in the world. You can visit Burghley House as part of a Great British Road Trips tour from Cambridge to York via Sherwood Forest. If, like me, you are an admirer of Canaletto’s paintings of Venice then visiting Woburn is an absolute must do. This Bedfordshire pile has the largest private collection of his works in the world – 24 of them. 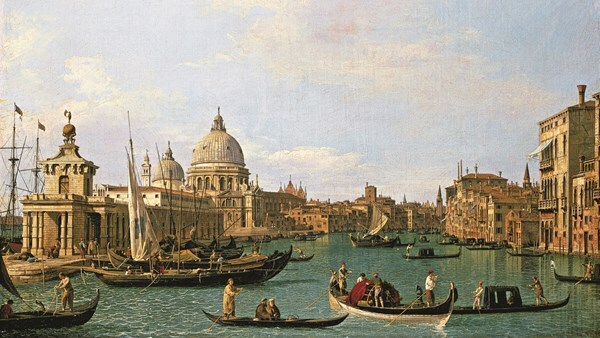 Lord John Russell (who became 4th Duke of Bedford in 1732) visited Venice while on his Grand Tour in 1731. It is thought that Lord John met with Joseph Smith, Canaletto’s agent, and the paintings were subsequently commissioned. It was fashionable to order a set of views of the places visited on the Grand Tour as a souvenir of your visit. 24 paintings eventually arrived in England; and within the Abbey Archives they have three bills to Joseph Smith, dated 1733, 1735 and 1736, and totalling just over £188 (about £16,000 today). So, a nice little earner, then . . . as Arthur Daley, of Minder fame, would say after looking at the value of each of them today. Like, several million pounds a pop. Other artworks on public view include the work of famous artists such as Reynolds, Gainsborough, Hogarth, Lely, Rembrandt, Tintoretto and Van Dyck. The collection also encompasses examples of the most expensive manufacturers of furniture, French and English in many periods, and a diverse collection of porcelain and silverware. This is the ancestral home of The Dukes of Bedford, the Russell Family, who at one stage owned one-tenth of the country. The Abbey was founded in 1145. The existing house was built in the mid 18th century and remodelled later that century. When the 6th Duke of Bedford inherited Woburn in 1802, he commissioned the famous landscape gardener, Humphry Repton (1752-1818), to create designs to enhance the gardens and parkland. Recognised as the first person to invent and use the title ‘landscape gardener’, Repton regarded himself as the rightful successor to Lancelot ‘Capability’ Brown. 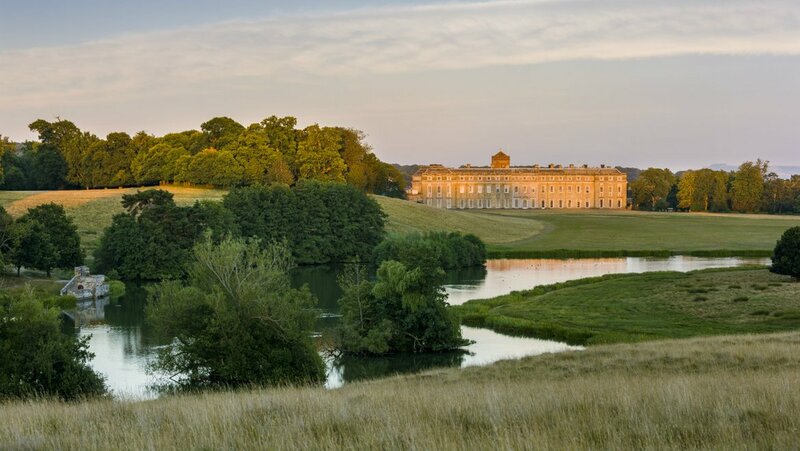 He produced over 400 designs and schemes for gardens great and small, but of these, he stated, “none were more fully realised than at Woburn Abbey”. He published his theories in two influential books, Observations on the Theory and Practice of Landscape Gardening (1803), and Fragments on the Theory and Practice of Landscape Gardening (1816). In these, he promotes his style and references his important work for the Duke of Bedford. The world-renowned Woburn Abbey Deer Farm was set up in 1993. It is now home to nine species of deer, the Red Deer and Fallow Deer which are native to Britain. Also, it is home to seven other species which originally came from Asia, including the critically endangered Pére David’s Deer from China which no longer exists in the wild. 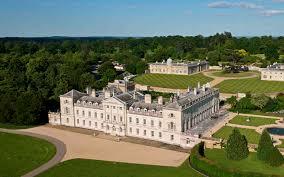 You can visit Woburn Abbey as part of a Great British Road Trips tour from Cambridge to Oxford. If you are a fan of copper kitchen utensils (love ’em, can’t afford ’em) then the kitchen there will be a revelation. 1000 – yes, that’s right, 1000 – pieces of polished copper batterie de cuisine. A pot for every possible occasion. Mind you, it has a lot more (I mean a lot more) going for it than just the kitchen equipment. 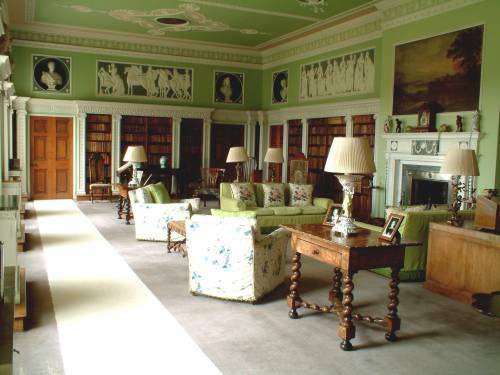 For instance, it has the largest art collection in any of the houses managed by the National Trust. It has works by Titian, Turner, Van Dyke, Reynolds, and Blake, as well as a carved room by English woodcarver Grinling Gibbons. You’ll come across Mr Gibbons almost as often as Mr Brown (as in Capability) when doing the rounds of the great British houses and you will marvel at the skill of the man. Among the other treasures is a copy of Chaucer’s Canterbury Tales. Housed in a display case in the North Gallery, the illuminated Chaucer manuscript with its decorative initials and borders was created in the 1420s. This is only 30 years after the original was written, making it one of the very earliest surviving texts of Chaucer’s masterpiece. You can visit Petworth as part of a Great British Road Trips tour from Brighton to Winchester. This Georgian mansion house is an outstanding example of Adam design, built in two stages – the two wings in 1725 by Scottish architect William Adam and the large central block completed in 1778 by his more famous son, Robert. The exterior of Mellerstain is a good example of Adam’s ‘castle style’. It is the interiors that special deserve attention. Here is Robert Adam at his masterful best. The plasterwork is outstanding, particularly in the library (pictured), and the attention to detail is especially noteworthy. The interiors are a mix of comfortable family home and exquisite staterooms, meant for show and to impress visitors. Scottish born Adam was one of the most successful and fashionable 18th-century architects in the country. He is also famous for his interior and furniture designs. The Robert Adam interior colours have been retained. The original hand printed wallpaper from the 18th and 19th centuries can be seen in the bedrooms. This estate covers 80 hectares of parkland with an Italianate styled terraced garden at the rear. Also, extensive lawns lead down to the lake. The estate also caters for holidays in their self-catering cottages. Located in the courtyard, visitors can book either of two cottages which are just a short distance from the house. There is also an 18th century stone cottage with a private garden. You can visit Mellerstain House as part of a Great British Road Trips tour from Durham to Edinburgh. The Great British Road Trips blog has been ranked in the top 25 of UK travel blogs by influential blog search site Feedspot.